Tuesday 5 November is a national day of civil disobedience. Meet at Euston Station - 7:30 am for the Protest Against Privatisation. This autumn we are very excited to be launching our 'sister campaign' Power For The People - "the Bring Back British Rail for the Energy Industry". Power For The People aims to challenge the monopoly power of the UK's 'big six' energy companies - who continue to hike up prices whilst dodging their tax obligations - by popularising the commonsense idea of re-nationalising our country's energy production and supply. 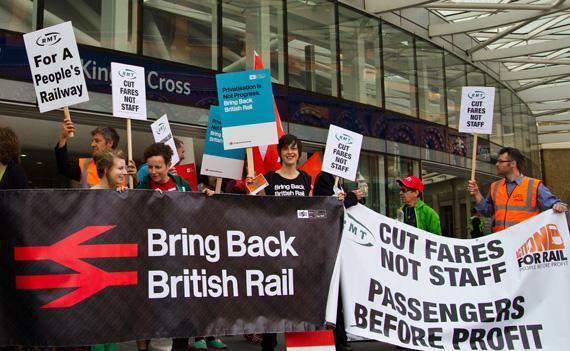 Working together with Bring Back British Rail, we aim to draw attention to the disastrous consequences of the privatisations of the '80s and '90s which have seen prices soar whilst standards have fallen. Our website went LIVE today, so please follow the link and be one of the first to join us!